Bill Marinelli is a graduate of Southampton College, New York, with a B.S. in Marine Biology. His first experience in the shellfish industry came as an undergraduate working with a local Indian tribe attempting to repopulate Shinnecock Bay with native oysters. After graduating in 1977, he was employed as a biologist by Pigeon Point Shellfish Hatchery in California. This company was responsible for many of the advances made in shellfish culture and they enjoyed much success as a major producer of shellfish seed, eventually supplying oyster farms around the world. Once trained in all aspects of oyster culture, Bill moved into a sales position with the company and later became their marketing director. It was not long, however, before Bill felt the desire to form a separate company committed solely to the marketing of cultured shellfish, and he soon departed on a course that prepared him for that goal. While encouraging friends and contacts acquired at Pigeon Point to grow more shellfish, he worked as a marketing consultant for a large shrimp farm in Hawaii. He was then hired by a well-known seafood wholesaler in the Bay area to assist in the opening of a retail seafood store. After the opening of Berkeley’s Monterey Fish Market, he secured a position training under the talented and successful Chef Mark Miller (4th Street Grill, Santa Fe Bar & Grill, Coyote Café, Red Sage). He founded Marinelli Shellfish in 1982, but continued to work as an oyster shucker until Marinelli Shellfish became profitable. Currently Bill spends his time traveling the globe, generating new markets for emerging seafood resources and working with chefs throughout Europe, Asia, the Middle East, and the United States. Since the early nineties Bill has been known as the “Oyster King,” a term coined in Hong Kong that has followed him around the world. He is the undisputed expert on oysters, and has brought many now famous names to the market place, including the Kumamoto, Hog Island, Olympia, Hama Hama, Barron Point, and Westcott Flat. Bill treats oysters with the same attention and respect given to wines and is able to wax poetic on the differences and flavors of any oyster. His company is now one of the largest distributors of half shell oysters in the world and it is renowned for the variety it carries. At any given time they may be working with 25 to 30 types! 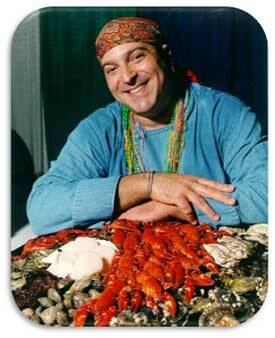 Bill Marinelli has also been instrumental in the development of many other products over the years, including farm raised mussels, pink scallops, Hawaiian limu, Alaskan sea scallops, native littleneck clams, and manila clams.